It’s the multi-faceted culture Russia has to offer that makes it so appealing. Places like St. Petersburg or the cities of the Golden Ring boast so much in art and culture that it would take near decades to even loosely acquaint yourself with what they have to offer, yet the frosty reaches to the north tell different tales of old castles, derelict towns, prison camps and time-lost labyrinths. This trip takes you across a land shrouded in both magnificence and secrets as you explore the bustling architectural glory of Vyborg, Yaroslavl and Moscow and right up to the Arctic treasures of Murmansk and the Solovetsky Islands. · Encounter the legacy of Russian tsar Peter the Great while exploring the enigmatic streets that showcase the many palaces and museums of St Petersburg. · Stroll Vyborg's cobbled streets and enjoy its quintessential charm on a visit to the only medieval castle in Russia. · Travel to Murmansk, the biggest city within the Arctic Circle, and venture through tundra to the deserted town of Teriberka by the Barents Sea. · Red Square has long been at the heart of Russian history – visit the austere mausoleum of Lenin, the initiator of the 1917 Russian revolution, contrasting with the eye-bulging treasure collection in the Kremlin and Armoury Museum. · This trip includes two long overnight train journeys. Conditions on the trains are simple but comfortable – a truly Intrepid experience and a great way to meet, and travel like, the locals. There is a toilet/bathroom and compartments with bunks/berths. Please note that we travel 2nd class on all overnight trains (4 people per compartment). While we always try to have our groups stay together, there may be times, where due to ticket availability, the group will be staying in different compartments and carriages. · As well as overnight train travel, we experience a variety of different transport types on this journey, such as a flight, ferries, public and private buses, the metro and plenty of exploring on foot. · We travel far north to the Kola Peninsula, Republic of Karelia and Solovetsky Islands. The weather can be unpredictable, and severe even in summer months. Bring your sense of adventure and be open minded to changes we may have to make due to weather conditions. · Please note that on occasion Lenin's Mausoleum and Red Square may be closed to the public during regular opening hours without prior warning. Zdrastvutye! Welcome to St. Petersburg, Russia’s second largest city. This adventure begins with a welcome meeting at 6:00pm. Please make sure your bring your passport and insurance details with you to the meeting. Please have two copies of your passport, visa and migration cards ready. One will be collected by your leader, the other is for you to keep on you at all times whilst on this trip. St. Petersburg, the ‘City of the Tsars’, is full of architectural monuments – if you’ve arrived early, it’s well worth tracking down some of the impressive structures throughout the city. The Palace Square, Kazan Cathedral, Peter and Paul Fortress, Saint Isaac’s Square and many more of these historic centres capture the city’s imperialist charm, showing touches of European influence in the architecture of these old buildings. 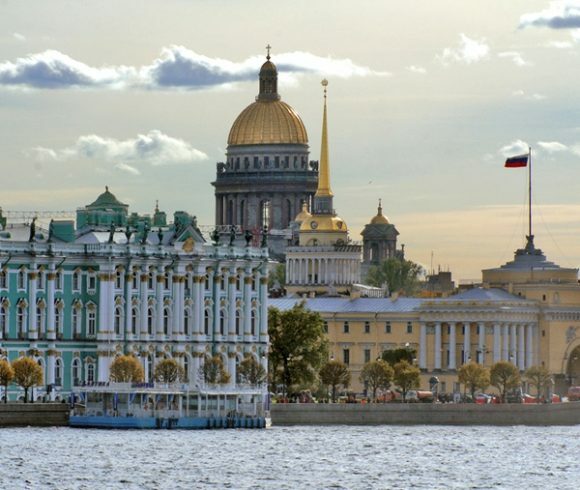 Spend a day exploring St. Petersburg with a guided walk through the former center of the Russian empire, learning about Nevsky Prospekt, the Neva River embankment and more historical parts of the city. 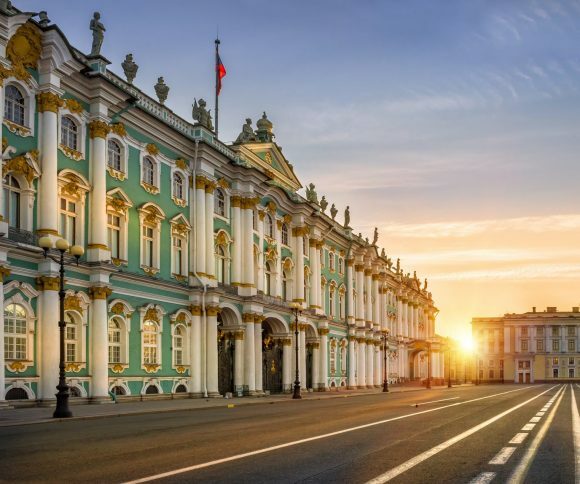 Later in the day, discover one of Russia’s most spectacular sights – the stunning Hermitage museum. Founded by Catherine the Great in 1764, the Hermitage is one of the largest and oldest museums in existence. The museum itself boasts over 2.7 million exhibits, displaying a diverse range of art and artefacts from across the world and throughout history (from Ancient Egypt to the early 20th-century Europe). Experts have calculated if you watch each item for one minute and spend 8 hours in the Hermitage daily, it will still take you almost 15 years to view everything that the museum has to offer. If there’s time after the visit to the Hermitage, indulge in some sightseeing during a free afternoon. Maybe head to the Mariinsky or Mikhailovsky Theatre to witness some world class performances (advance bookings essential). Start the day with a free morning in St. Petersburg. Once the afternoon swings in, take a private vehicle on a 2 hour drive to Vyborg, a beautiful provincial town with an iconic medieval castle located on its riverside. The city has been at the centre of many border disputes, jumping back and forth between owners for most of history. Vyborg remained a Swedish territory up until the 1300s when Tsar Peter the Great captured the city for the Russian tsardom. Just over a century later, it fell into the hands of the Finnish before the Soviet Union returned to take it in 1939. A few tussles between each state ensued and Vyborg now rests in the hands of the Russians. Many Finnish people still consider Vyborg a favourite destination – there’s every chance you’ll bump into the odd Finn along the way. 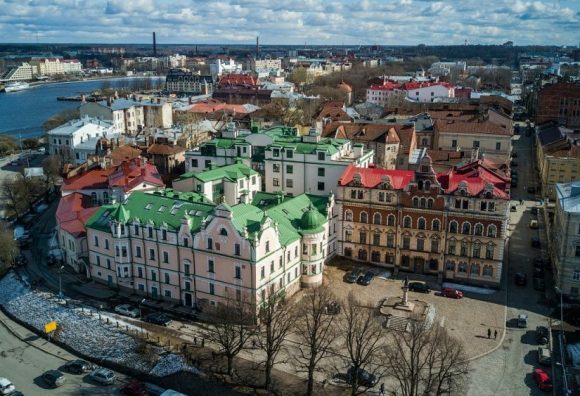 Begin exploring Vyborg on a guided walking tour, strolling along its cobbled streets and inspecting some of the classic buildings in the area. Head up to the the iconic 13th-century castle, where both an inbuilt museum and a beautiful view of the entire town awaits. A trip to Vyborg’s old town boasts some of the best attractions in the city – the back streets are full of excellent cafes, shops, markets and churches just waiting to be uncovered. The walking trip comes to an end at one of the world’s architectural masterpieces – the Vyborg City Library. Designed in the 1930s by Finnish architect Aalvar Aalto, the building still serves as a cultural centre for the people of Vyborg and many a concert or lecture is held here to this day. If you have any further free time today, a trip to the gorgeous Mon Repos Estate and Park right on the Gulf of Finland is highly recommended. Enjoy a free morning in Vyborg, taking the time to wander through some of the more vibrant parts that you may have passed on yesterday's orientation walk.In the late afternoon, say goodbye to Vyborg and return to St Petersburg. Board our first train from Ladozhskiy Vokzal and travel overnight (approx. 15 hours) towards the Russia's north and the gateway to the Solovki Islands. We disembark in Kem mid morning and transfer to the ferry for our journey on the White Sea to the Solovetsky Islands, also known as "Solovki" (approximately 2 hours). These remote islands have a turbulent and varied past. Historically, the islands housed a famous Russian Orthodox Monastery from the 15th century onwards, serving as the site of many repelled attacks attacks across the ages. The communist era saw it the islands become a place of exile and home to one of the earliest GULAGs (prison camps) from the early 1920s. Despite this dark past, the natural beauty of the islands is breathtaking, especially during the "White Nights" of midsummer when the sun never fully sets and you are treated to long hours of sunset merging into daybreak without true night inbetween. We stay in a comfortable hotel on the main island, Bolshoy Solovetsky, and expore some of the main sights on a walking tour with a local guide today, including the now re-established Transfiguration Monastery - a UNESCO World Heritage site. In free time here you may choose to hire a bike and explore some of the trails around the island or visit the Botanical Gardens (from where there are some excellent views). Special Information The sea journey to Solovki can sometimes be rough and the weather in this region unpredictable. If you suffer from sea sickness we highly recommend bringing medication with you from home. Take a boat trip to the nearby Bolshoy Zayatsky Island today a place shrouded in myth and mystery. Explore the well preserved mossy stone labyrinths built 2,500 years ago and reflect on the fact that these remain, but yet there is no trace of the fact that the island was used for female solitary confinement during the GULAG era. The origins of these labyrinths are uncertain, let alone their uses but it’s been suggested that they symbolise the border between this world and the underworld, assisting the souls of the dead to travel to the afterlife. Others also speculate there were built as complex fishing traps! The climate here is fairly severe resulting in little vegetation other than moss and low growing shrubs. Dress warm both for the boat here and back and for the windswept terrain. Arrive in Murmansk this morning morning. After checking in to our hotel it's time to head out to explore on a city tour. This bustling, modern metropolis boasts plenty of Soviet-era architecture set to the backdrop of stunning Arctic scenery. Murmansk is often referred to as a 'hero city’, and today’s guided walking trip will highlight its role in the Great Patriotic War (World War II). Begin with a visit to the Alyosha monument, dedicated to the Soviet soldiers, sailors and airmen who fought so valiantly to defend their country. Continue to the angular Lighthouse monument, housing a memorial hall dedicated to sailors lost at sea. Check out another monument, this time for Kirill and Mefodiy, credited as the creators of the Cyrillic alphabet. Lastly, ascend to a lookout point with sweeping views over the city. There’s an opportunity to explore some impressive Russian naval engineering too. Take a trip to the only aircraft carrier in Russia, the Admiral Kuznetsov – assuming the vessel isn’t out at sea on duty. Visit the decommissioned Soviet nuclear-powered icebreaker Lenin – the first vessel in the world with an atomic reactor. Launched in 1957, this ship was used to clear sea routes for cargo ships travelling along Russia’s north coast. Between 1960 and 1965, the Lenin covered over 136,790 kilometers (85,000 miles) during the Arctic navigation season – most of this distance was through ice! Take a day trip to Teriberka, an Arctic fishing town situated on the northern coast by the Barents Sea. Travel along rough roads on a 2.5 hour drive through tundra before arriving at the town. While the adventure may be bumpy and long, the experience of seeing this half abandoned town offers a real life historical view of the rise and fall of provincial life in this isolated, challenging part of the world. Perhaps stop in at the local ship "graveyard", where old wooden boats can still be seen sitting in clear view of the houses across the river. For any movie buffs on the trip - Andrey Zvyagintsev’s Golden Globe winning film Leviathan was shot here in 2014. Lunch is included during our visit here. Return to Murmask for the evening. Embark on a lengthy day of travel today to take us back to the "mainland". First a 2.5 hour flight from Murmansk to Moscow and then private transport to Yaroslavl, one of Russia's famed "Golden Ring" of former ancient capitals. Yaroslavl is situated on the banks of the Volga river and is the largest city of the Golden Ring. It boasts some impressive buildings in the country, retaining many beautiful old structures that date back to the 17th, 18th and 19th centuries. 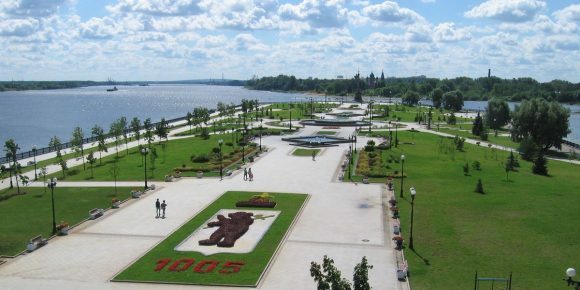 As a result, much of Yaroslavl has officially made it onto the UNESCO World Heritage list. Settle into our riverside accommodation in preparation for a full day of exploration tomorrow. Yaroslavl is a goldmine of architectural wonders and the best way to experience them is on a guided walking tour. Sitting at the confluence of the Kotorosl and Volga Rivers lies the Spassky Monastery, a 12th-century marvel with brilliant green rooftops. For a small extra cost, the bell tower can be climbed for a marvellous panoramic view of the city below. Afterwards, see the Church of St. Elijah the Prophet, regarded as one of the best-preserved monuments of Yaroslavl. Finish up the walk by wandering along the riverbank, taking in views of the city and the surrounding landscape. The rest of the day is free to explore on your own. There is the intriguing little Museum of Music & Time, options for Volga River boat trips, and all manner of cafes, restaurants and bars to relax in. Depart from Yaroslavl this morning and stop off at one more Golden Ring town - this time Sergiev Posad (approximately 3 hours). Founded by St. Sergius of Radonezh in 1340, Sergiev Posad is known as the spiritual centre for the Russian Orthodox Church and considered the holiest place in the country. See the beautiful UNESCO World Heritage-listed Trinity Lavra. This near seven-century old area still houses over 200 monks and consists of nearly 50 structures dating from as far back as the 15th century – it’s an impressive piece of Russian Orthodox history to be sure. Enjoy lunch at the monastery and then travel onward to Moscow (approximately 2 hours) - the final destination of our trip. Check into our centrally located Moscow hotel and rest up for another intense day of sightseeing tomorrow. 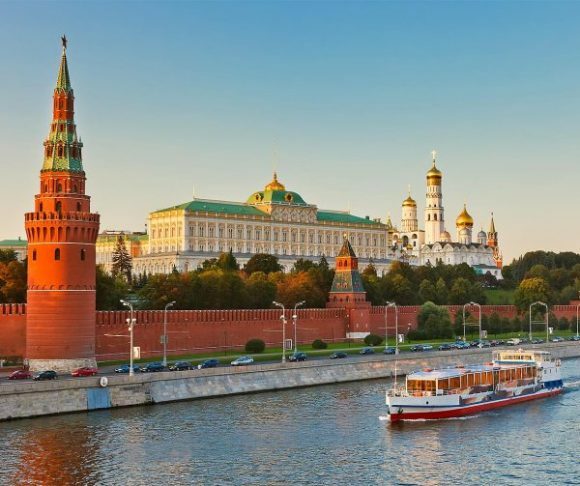 This great city has survived centuries of revolution and seen Russia through some of its most turbulent years, from tsardom to communism, to today's contemporary society. Central Moscow may be modern in parts, but its fascinating, historic heart hosts a wealth of sights to see. Explore cobbled Red Square and witness the brightly coloured domes of St Basil’s Cathedral, the opulent GUM Department store, the fairy-tale building of the State Historical Museum, and the imposing walls of the Kremlin. From the days of Ivan the Terrible to the military parades of the Cold War, the square has long been at the heart of Russian history. Catch a glimpse of revolutionary leader Lenin at his austere eternal resting place before entering the Kremlin grounds, home to the oldest and most important churches in the country, and where many Tsars and Tsarinas are laid to rest. Walk through the soaring towers and cathedrals of the political and spiritual heart of Russia before entering the Armoury Museum, home to an eye-bulging former royal collection of ambassadorial gifts, Faberge eggs, coronation robes and glittering jewels. Afterwards perhaps take the metro to see elaborately decorated stations unlike any other. From sculptures depicting the glory of the soviet days to ornate chandeliers and stained glass windows, these are the 'Palaces of the People'. Today is our final day as a group and there is so much in Moscow to see that we highly recommend staying a few extra days. Enjoy a final optional group dinner with your fellow travellers tonight. Special Information On occasion Lenin's Mausoleum and Red Square may be closed to the public during regular opening hours without prior warning. As Moscow's premier tourist attractions, tickets for the Kremlin and Armoury are in high demand, and the Moscow Tourism Administration sets strict quotas to control visitor numbers. Time in each area is also limited to 90 minutes, with any exceptions possibly resulting in the guide losing their license. While we appreciate that some travellers would like to spend longer in the Armoury Museum, we ask for your understanding that the guide is under pressure to keep to the schedule. The Diamond Fund isn't included in your tour, but after the Kremlin and Armoury there may be time to visit. Entrance tickets can be purchased in the ticket office at the Armoury. The Diamond Fund is open for visitors from 10am-1pm and from 2pm-4pm. Thursday it is closed.